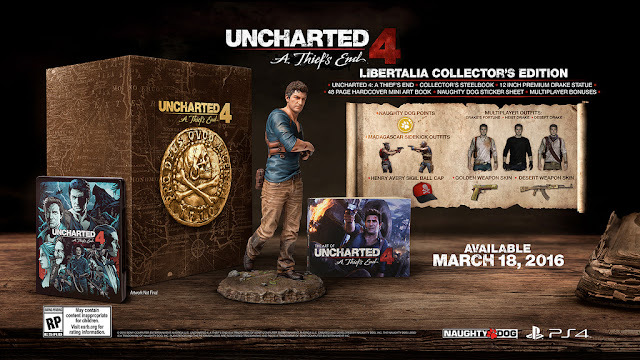 Dr Jengo's World: Uncharted 4 Collector's Editions Revealed, with Release Date confirmed! 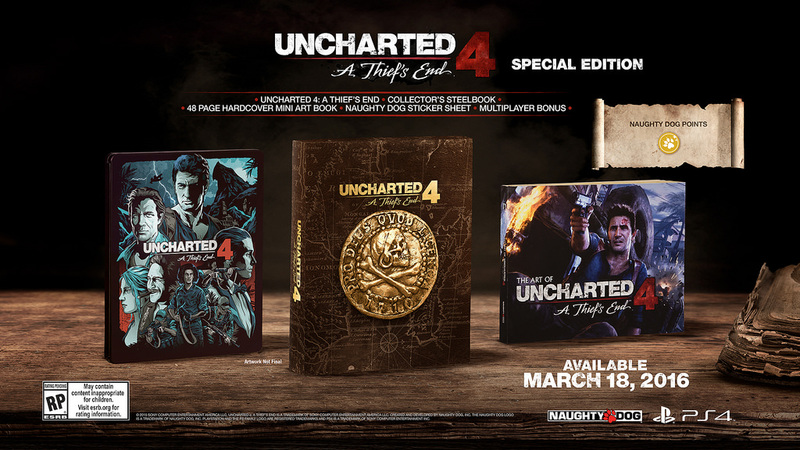 Uncharted 4 Collector's Editions Revealed, with Release Date confirmed! Uncharted 4: A Thief's End will be releasing on Mar 18 2016! With the release date confirmed, there are 2 Collectors' Editions revealed for North America & Europe as well.. If, for some reason, you aren't interested in the figurine but want the rest of the physcial goodies, there's the Special Edition. Looks like the Uncharted 4 Triple Pack is UC4's version of the Season Pass including story DLC & 2 MP DLC Packs. Here's what Playstation Blog has to say about the UC4 Triple Pack..
"The Triple Pack can also be purchased separately as an add-on. And if you already pre-ordered Uncharted 4: A Thief’s End through PlayStation Store, you can upgrade to the Digital Deluxe Edition for $20 more." "There’s also a Pre-Order Bonus Pack we’re adding to any pre-order of Uncharted 4: A Thief’s End (physical or digital). It includes the Uncharted: Drake’s Fortune outfit multiplayer customization, the Golden Weapon customization, and a pack of Naughty Dog Points. Our awesome retail partners are also offering special goodies depending on which retailer you choose pre-order with. 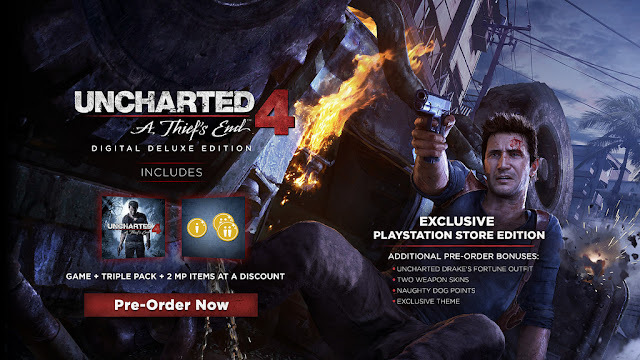 Pre-order via PlayStation Store to receive the Uncharted 4: A Thief’s End Dynamic Theme and the Desert Weapon customization."